With tribe leader gone along with his sons the lord of Kharwarizm, Jehungir Agha sets forth a plan to take out the Kozak tribes, he sends assassins who attack during Taraslan’s pyre and quick begin to exterminate the Kozak tribe, During the battle the body of Taraslan rises, covered in flames Taraslan grabs the leader of the assassins and burns him to a crisp. 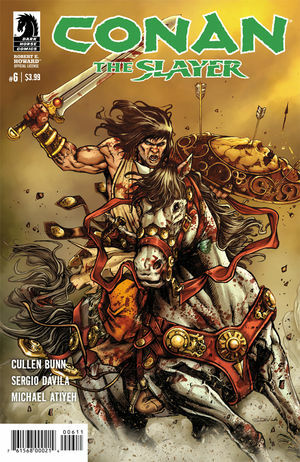 When it’s all said, and done the Kozak name Conan their new leader despite his refusal. 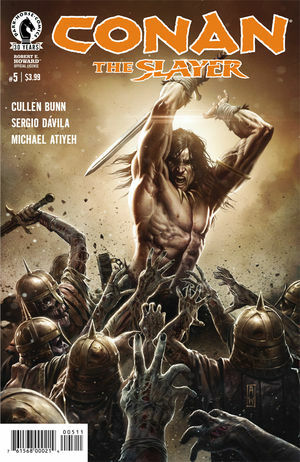 Conan becomes conflicted about the responsibility of leading the Kozak tribe and decides to take a walk through the woods and comes across a blood trail, at the end of the trail Conan is shock to find a half-eaten human corpse, in the background we see a humanoid beast looking at Conan from within the trees.